Traditional plants that are used in topiary, like bay and rosemary, can take years to mature. If you’d like a standard in a fraction of the time — six months to one year — try growing a coleus standard like the one in the photo at right. Step one — Potting up. It doesn’t matter what size coleus you start with, as long as it has a straight center stem, which is called the central leader. A small plant in a 4-inch pot is fine. Just move it up to a larger pot as it grows like I’m doing here in the photo at left. Giving the roots more room will help the plant grow taller. By the time it’s 3 feet tall, it should be in a heavier, 12-inch container — like terra-cotta. That way, the top-heavy coleus won’t tip as easily when it’s mature. A smaller standard that’s 2 feet tall would be fine in an 8-inch container. Use a general purpose potting mix, water regularly and fertilize monthly with a 15-30-15 formula to keep your coleus happy. Step two — Staking. When the plant is 8 to 10 inches tall, it’s a good idea to tie it to a bamboo stake for support that’s a little taller than the plant. The best time to do this is when you’re repotting. That way when you stick the stake in, as I’m doing in the photo at left, you’ll have less chance of damaging the roots. 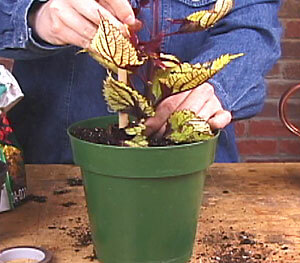 Attach the coleus stem to the stake with a piece of twine or stretch tie in a figure 8. To do this, bring the twine around the back of the stake, crossing it in an “X” between the plant and the stake. 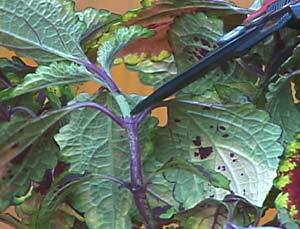 Then tie it loosely around the coleus stem. 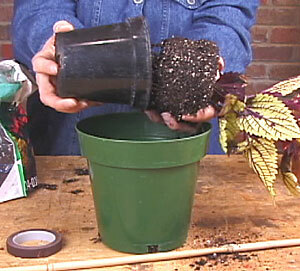 Add heavier and taller stakes each time you move the plant up to a larger container. Step three — Pruning and pinching. Initially, all you have to do for your coleus is make sure the central leader stays straight as it grows. It’s not hard, just keep it tied to the stake and make sure it has good light so it doesn’t tart leaning in one direction. Those leaves growing along the main stem aren’t anything to worry about. They help feed the plant and will eventually drop off or can be removed later. Branches, on the other hand, need to be taken out. They form at the leaf axils, the spot where the leaf meets the main stem. If you catch them early, like the one in the photo, you can gently pinch them out or rub them off. Top it off — When your coleus reaches the final height you want, snip off the central leader. This will encourage branches to start forming the full, rounded head. Start snipping at 1 to 2 feet if your goal is a tabletop standard. For a plant that will sit on the ground, you’ll probably want something larger — more in the 3- to 5-foot range. Remember, when you snip off the central leader, the branches that form will be a few inches higher than where you’ve snipped. Step four —Pruning. For a pleasing look to your standard, a good ratio to keep in mind as you’re pruning is 2/3 stem to 1/3 head. For example, if the plant is 36 inches tall, the bare stem should be 24 inches and the head of the standard about 12 inches. When you start getting branches at the head, keep them pruned back to the second or third node from the stem. This encourages more side branches and will help your plant fill in. A node is the bulging point on a stem where side shoots or leaves emerge. You can see one just below the pruner tip in the photo at left. 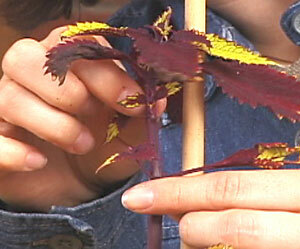 Also, because coleus stems are brittle, they can snap under their own weight if you don’t keep them pruned back. Every time you pinch a branch, it’ll form two more. The branches that form along the nodes you pinched earlier are called “secondary growth.” You’ll want to keep each of these cut back to two or three nodes long. If flowers form, it’s usually a good idea to remove them so the plant puts the energy into the foliage instead of flowers. Press the advance button (») to move between videos. Keep pinching the tips so it stays in shape. Fertilize once a week at 1/4 strength with a 10-10-10 formula. If you keep it outside, make sure it’s either sheltered or secured on windy days so it doesn’t fall over and break. 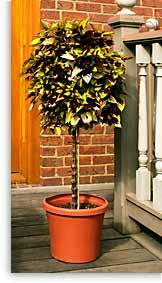 To keep your plant vigorous, repot it every year and do a little root pruning in the process, if needed. It may sound intimidating, but it’s really easy. First, carefully remove the plant from the container and gently brush off as much soil as you can. Look for any roots that are thick and woody and trim them back. Repot the standard in fresh soil in the same container. Overwintering— To keep your coleus standard so you can enjoy it again next year, place it in a sunny south- or east-facing window. Flourescent lights work, too. Make sure your coleus is kept out of drafts so the foliage doesn’t drop. It’s still important to water regularly, but stop fertilizing until early spring to give your coleus a rest. Don’t worry if the coleus loses some foliage or the color fades or even changes a little. When the longer days of spring arrive, it should bounce right back.